As for sunscreens and sublock, we have used and tested quite a handful of brands and are disappointed every time. 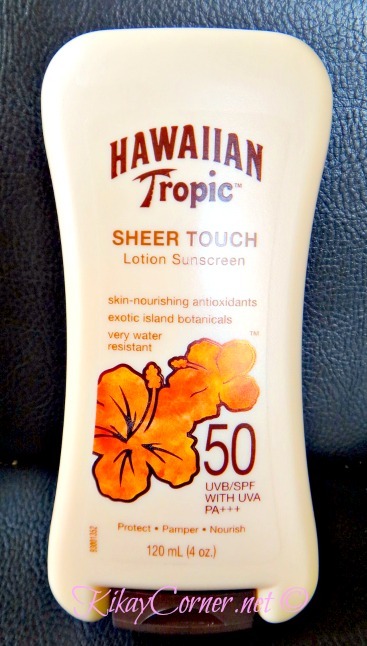 But with the Hawaiian Tropic Ozone SPF70, which we always go back to repurchasing in the previous years, we hardly ever get sunburnt. So with the brand’s history of being able to deliver, I grabbed a hold of this Sheer Touch Lotion SPF50. Here’s hoping this delivers too. My first impressions of this sunblock is that it sure is sheer as its name implies. I applied it at the back of my hand and nothing of that plastic chemical smell common to regular sunblocks. Practically zero grease too! Now if it keeps us covered the whole time we bathe in the sun, then I’m totally vouching and maybe even hoarding some bottles too.